It’s cold and crisp and even and Frostie the Snowman couldn’t be happier as he gets ready to celebrate his favourite time of year. The Snowman musical is back in London’s West End and tiny children are looking forward to snow and sledges and the big man in the red suit. So Frostie’s decked himself out in his finest dazzling crystal outfit. His black fedora is firmly on his head, he’s borrowed a scarf and his jet crystal eyes sparkle as he looks forward to surveying the Christmas scene from a lapel, pocket or hat. 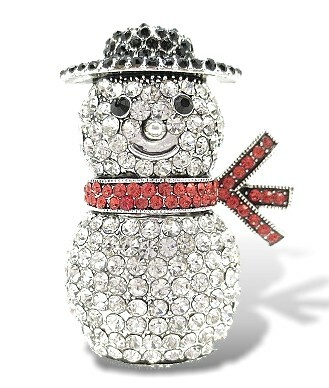 And happily, unlike his namesake in the story bearing his name, he doesn’t have to worry about the temperature because he’s made of the most sparkling crystal rhinestones. So he’s built to last for years. Size: 4.4cms x 3.5cm (1¾” x 1½").